Featured articles appear on the front page of the website, in the “Recent Posts” section. This article originally appeared on Christianity Today. I have the pleasure of announcing a new book by my friend and colleague, Dr. A.J. Swoboda. A. J. directs our Blessed Earth operations in the Pacific Northwest. His book is called Subversive Sabbath. 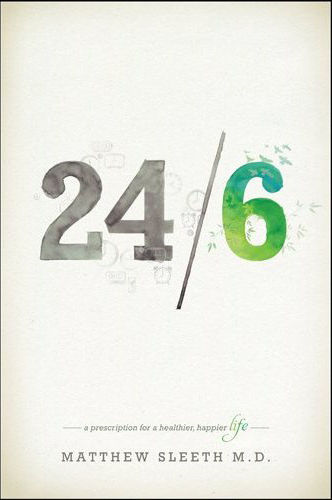 For those of you have read my last book, 24/6, (and for those who haven’t), I highly recommend that you get ahold of A.J.’s book as soon as possible. The timing of its launch could not be better, as it makes a great read leading up to Easter. As a physician, I’ve listened to thousands of hearts. During prenatal exams, I’ve heard the rapid swish-swishing of babies still in the womb. Often, moms and dads burst into tears when they hear their child’s heart for the first time. I’ve smiled at the strange murmur those same thumb-sized hearts make when they are born into the great big world, fetal shunts closing of their own accord as the baby breathes independently for the first time. I’ve listened to the chests of three-year-old children as they inhale deeply–and then wonder if the man in the white coat can hear their thoughts through those tubes attached to his ears. I’ve listened to athletes’ strong, slow hearts. I’ve heard asthmatic hearts pounding away in fear, and the muffled sounds of failing hearts. I’ve listened to the hearts of saints and murderers. I’m in the first generation of physicians to ever listen to the heart of one person after it has been transplanted into another. Doctors and nurses listen to patients’ hearts using a stethoscope. Although this is convenient, it’s not necessary. In fact, the stethoscope wasn’t invented until a generation after our country became a nation. For thousands of years, physicians listened to heart sounds without the aid of a stethoscope. They simply laid their ear on the chest of their patients. Now, it is only children who lay their heads on the chest of their parents and listen to beating hearts. My daughter used to love curling up in the big green chair by our fireplace in winter and falling asleep listening to my heartbeat. These days my children are grown. I’m still close to them and hug them every time I see them, but it is only my little granddaughter who’s falling asleep on my chest now…or so I thought. Recently, my son dropped by our house after a long shift at the hospital. He flopped on the couch next to me, and within a few minutes he was asleep, his head was resting on me. He was no longer a pediatrician at the university hospital; he was just my little boy, resting in his father’s arms. 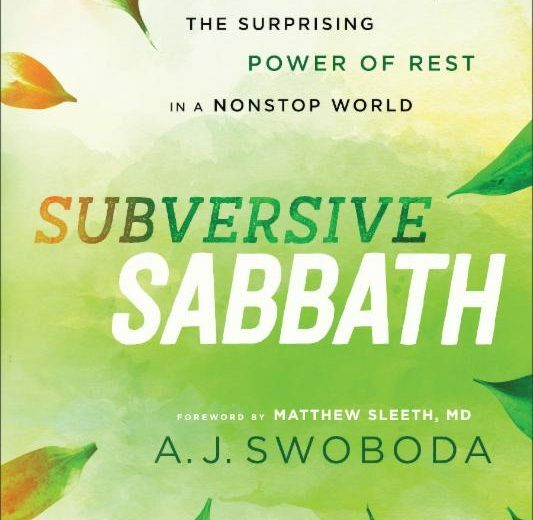 I had just finished reading Subversive Sabbath, and I got to thinking about our exhausted world, laying our heads down, and hearing heart sounds. These thoughts led me to the thirteenth chapter of John’s Gospel–the setting of the Last Supper. The chapter begins with Jesus washing the disciples’ feet. Later, Judas dashes off to betray Christ. The chapter ends with Jesus giving a new commandment to love one another. There in the middle of the most extraordinary events in human history is a man listening to the heart of God. Don’t you wish you could lay your head down on the Maker of the universe and just listen to his heart? Don’t you wish that you could lay all your problems down for just a moment and rest on Jesus? The heart of A.J. 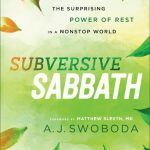 Swoboda’s book is that you can: starting next Sabbath, for twenty-four hours, you can lay your head on the chest of someone who loves you enough to die for you. Subversive Sabbath is an invitation to rest in the Lord. Ultimately, however, reading about Sabbath is like looking at a picture of food. It will not fill you. It can only whet your appetite. You must finish the book, put it down, and actually do the Sabbath. You must get your life quiet enough one day out of the week to hear God’s heart. Only then will you experience the counter-cultural joy of Shabbat shalom, Sabbath peace. I have been blessed by years of friendship with A.J., and his latest book is the outflowing of a heart that loves the Lord. I hope you, too, take the time to get to know him–and God–more through Subversive Sabbath (and don’t forget to leave a review on Amazon!). 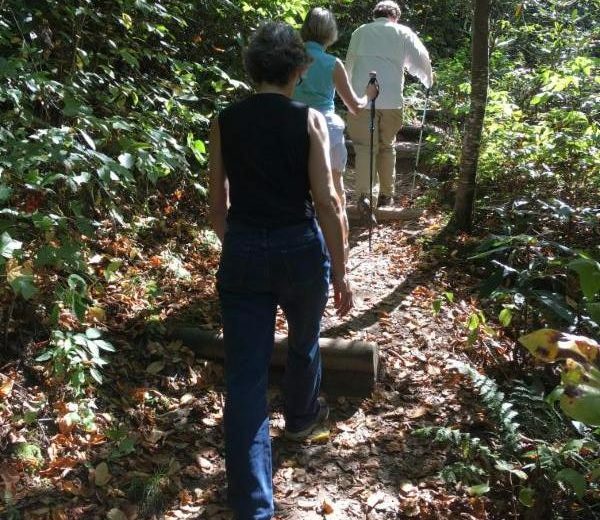 For a long time, a visit to the Joyce Kilmer Memorial Forest has been near the top of Matthew’s bucket list. 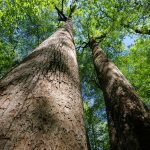 Named after the WWI veteran who wrote the beloved poem “Trees,” it is one of the largest contiguous tracts of old growth forest in the Eastern United States. It encompasses trees that are over 400 years old and 20 feet in circumference standing 100 feet tall. 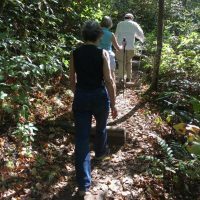 So, when I saw that we had a free afternoon during a three-day trip last month, I asked some friends if they’d like to join us for a hike. The forest was about 90 minutes from where we were staying. From the moment we got on the Foothills Parkway, every vista was an affirmation of God’s goodness–mountain overlooks, leaves just beginning to acknowledge the coming change in seasons, and streams interrupted by lively waterfalls. It was midafternoon by the time we arrived. The four of us chatted while navigating the first half of the hike, pointing out especially large tree specimens to each other and marveling over the girth of the trees. 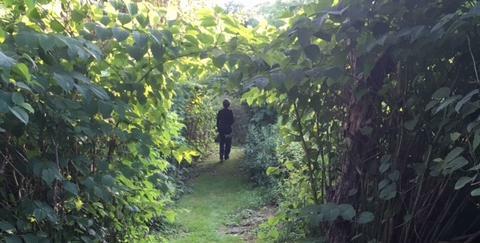 It felt like we were exploring an outdoor cathedral. Walking in the presence of God’s oldest creatures made us feel both small and large at the same time–our lifespan fleeting, our responsibilities as God’s appointed caretakers great. As soon as we ascended the second half of the figure-eight trail, other hikers became far fewer. We spotted two fallen trees and decided to rest. Our friend suggested that we begin in prayer and then sit in silence for five minutes. As we closed our eyes and listened, the wind picked up. For the first time in my life, I heard a wind approaching. Stronger and stronger, it gathered over the valley and ascended the mountainside. The leaves began ringing, almost like wind chimes. Our five minutes of silent contemplation stretched into ten, then fifteen. No one wanted it to end. The wind died down, and we opened our eyes. We had a long drive back, and a dinner meeting scheduled, so we headed back to the car, our ears still ringing with echoes of our sacred silence. Over the course of the three-day conference, our friend Boyd Bailey, head of the National Christian Foundation in Georgia, led the morning devotions. Providentially, the topic he chose was silence. Boyd believes that silence is the language of God, and God expects us to be fluent in His language. While no one pats us on the back for being skilled in silence, learning to sit with the Lord in quiet grows our inner strength, sensitivity to the Spirit, and Kingdom perspective invaluably. After Jesus fed the 5,000, he dismissed all but the twelve and then went to be silent with his Father. As many of us have learned the hard way, BUSY stands for Being Under Satan’s Yoke. Either we manage to have quiet in our lives, or the noise will manage us. 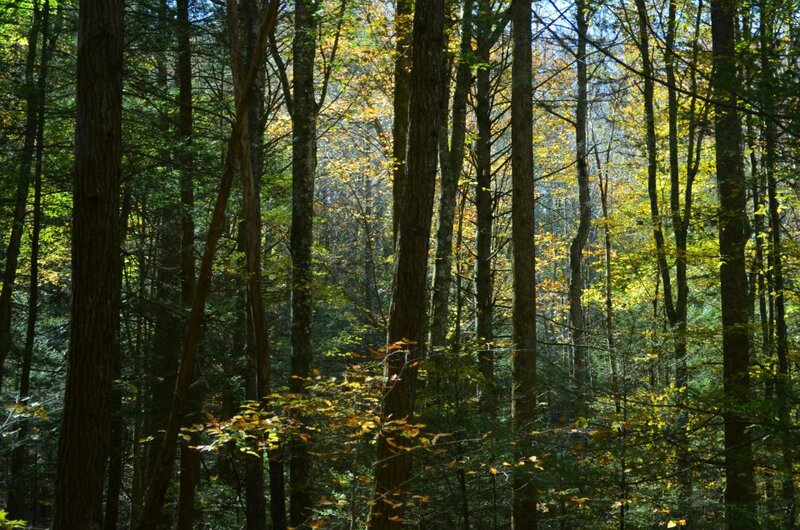 Our fifteen minutes of quiet in the Joyce Kilmer Forest reminds me of Psalm 1. God wants us to be like a tree, with deep roots that reach out for water and hold us firm. No matter what hurricanes or wildfires or floods come our way, we will stand fast in the Lord. 1. They love, love, love their gardens. I saw way more beautiful riots of color in front yards than chemically-treated grass lawns, and we were shown around flower beds and vegetable patches at almost every place we stayed. 2. Public transportation is abundant. Buses are everywhere, and the passenger train system is still a vital part of the infrastructure. 3. They pay for plastic bags. Many more people bring reusable bags when they shop, since most stores charge five pence (about seven cents) per plastic bag. Since the charge was imposed in 2016, plastic bag usage has decreased by over three quarters and hundreds of millions of pounds have been raised for charity. 4. Outdoor recreation is highly valued. 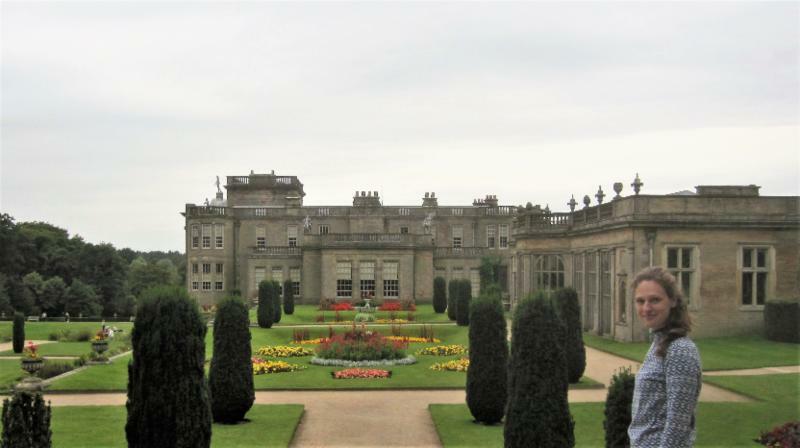 Many of the British tourists we met, especially in the Lake District, planned their long weekends around hiking trails, cycling routes, or sailing. 5. They build to last. We saw tons of homes that were built centuries ago and are still being used today; quality craftmanship, rather than square footage or modern luxuries, seemed to be a priority in every house and B&B where we stayed. 6. Bigger isn’t better. Cars, washing machines, trashcans–they’re all, on average, smaller than in the US, causing less fuel consumption and encouraging less waste. 7. Food is local. Grocery stores often label the farm where their produce was grown; “chippies” take pride in serving locally caught fish; and even fast food chains advertise 100% British meat. 8. Temperature is less controlled. Iced drinks are less common, eggs aren’t refrigerated (don’t try this one at home, unless you buy your eggs from a neighbor or raise them yourself: it’s only a safe practice as long as they haven’t previously been stored at low temperatures), AC is virtually non-existent, and the general consensus is that it’s more sensible to put on another layer than turn up the heat. 9. Clothes dryers are rare. Several of our hosts told us that they either didn’t have a dryer or hardly ever used it; they’d dry their laundry on a line in the garden on sunny days and hang clothes up to dry near the woodstove on a “Lancaster air dryer,” a wooden rack with parallel bars suspended by a pulley from the ceiling. This short list of sustainable practices I witnessed was only from several weeks spent in one region of England. Have you noticed other ways foreign cultures practice stewardship in your travels abroad? Send us your observations and we’ll compile a list to publish on blessedearth.org! 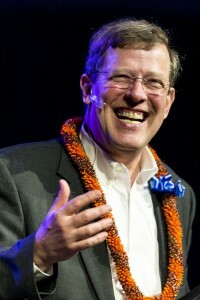 Matthew Sleeth, MD, is the author of Serve God, Save the Planet and 24/6. A former chief of staff and emergency room director, Dr. Sleeth left his practice to teach, preach, and write about biblical stewardship. 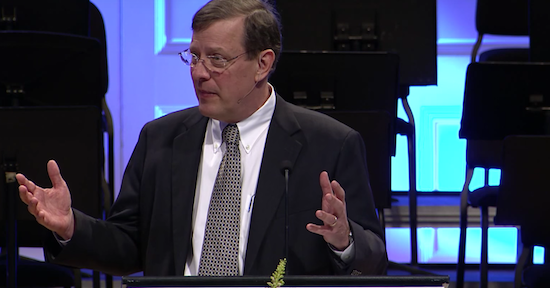 A highly sought after speaker, Dr. Sleeth has spoken at more than 1,000 churches, campuses, and events, including serving as the monthly guest preacher at The Washington National Cathedral. 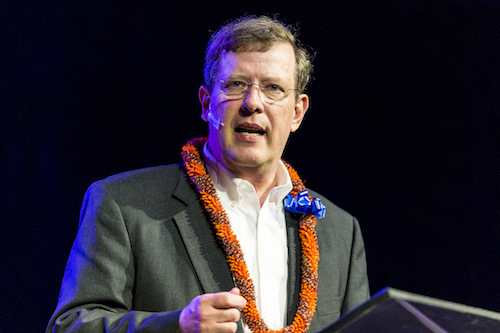 Recognized by Newsweek as one of the nation’s most influential evangelical leaders, Dr. Sleeth is the executive director of Blessed Earth and founder of the Seminary Stewardship Alliance. *The article originally appeared on greenjesus.com. 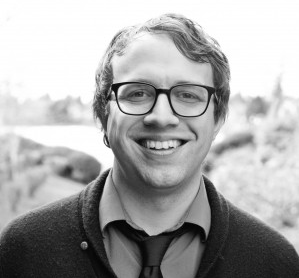 Matthew Sleeth just got back from the annual gathering of the Seminary Stewardship Alliance (SSA), which was held this year in Portland, OR. While there, he was given a surprise by the leadership of the SSA: they inaugurated an annual prize in his honor! 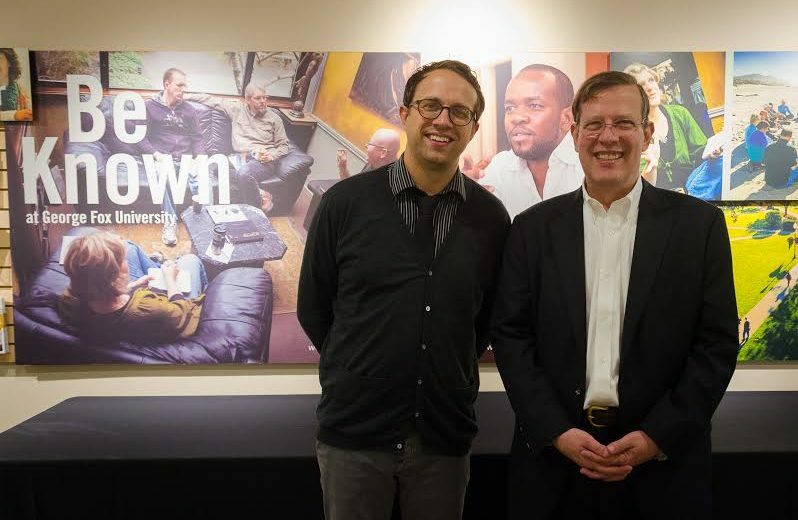 Each year, the Matthew Sleeth Seminary Stewardship Alliance Award will be given to the school that has made the greatest impact in creation care theology and practice. In just a few years, the SSA has grown from twelve founding institutions to nearly fifty schools. Last week, about seventy representatives from member schools participated in our annual gathering. These schools are now training thousands of pastors around the world to teach, preach, model, and hold each other accountable for good stewardship practices. Why is this important? Today, the Church is so often seen as part of the problem. The SSA reminds us how we can become part of the solution. From Genesis to Revelation, there is no greener book than the Bible. Instead of being known for what we are against, the SSA shows what we are for: caring for God’s beautiful gift of creation until the return of Jesus, when leaves from the Tree of Life, watered by an unpolluted river, will heal all the nations. More than a decade ago, when Matthew and I first moved to Wilmore, Kentucky, we prayed that God would give us an opportunity to make a difference in our new hometown. The very next day a neighbor, Andy Bathje, knocked on our door. Andy told us about Ichthus, one of the largest Christian music festivals in the country, which was happening in Wilmore the following week. Knowing our passion for creation care, he mentioned that none of the waste had ever been recycled during the event, which drew 15,000-20,000 attendees each year. Would we be interested in partnering with him to change that? “Yes! We’d love to help!” We purchased 50 durable bins, recruited local youth volunteers, and went to work. Those were some of the loudest, hottest, most gratifying three days I’ve ever experienced! We recycled 50,000 bottles and cans in that first year alone. 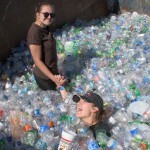 With Andy’s help, Blessed Earth continued to increase the recycling at Ichthus. We distributed free water to attendees who wanted to use reusable water bottles, encouraged recycling with prize drawings, and educated interested attendees about recycling and creation care. More and more people came to volunteer; some band members even pitched in! When Andy became the executive director of AdventureServe Ministries, he incorporated recycling into his mission experience for youth. We gave the recycling bins to AdventureServe so they could continue the work we’d begun together. Several years ago, AdventureServe hosted the youth of Shepherd of the Prairie Lutheran Church from Huntley, Illinois, who participated in the recycling efforts at Ichthus as part of their learning about creation care. They were so inspired that they contacted another festival closer to home, Lifest. The organizers had no objection to free help reducing their trash! They have now been recycling at Lifest for three years. After a decade of use, the recycling bins we purchased were still going strong, but the lids needed to be replaced. 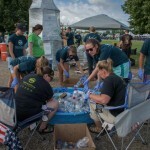 Blessed Earth donated new bin lids and an eye-catching cage for Lifest 2016 attendees to deposit bottles in; participants wrote their names and phone numbers on their bottles, which served as “entries” into prize drawings. 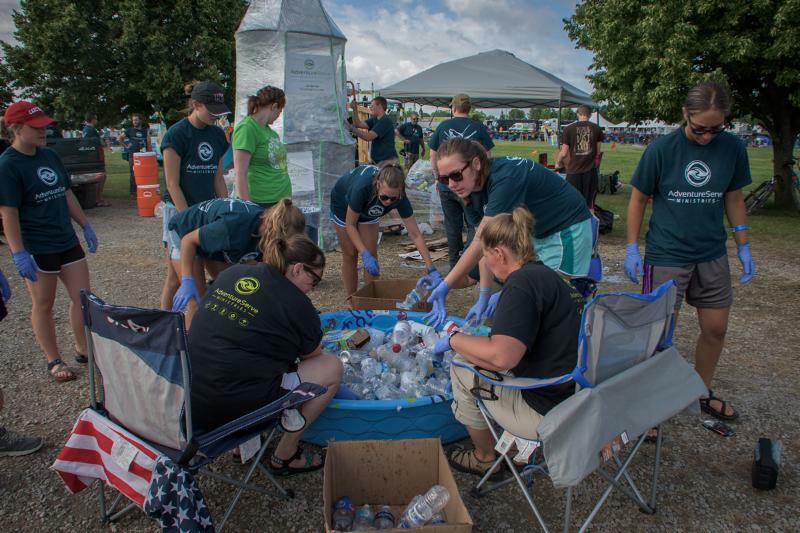 This year, AdventureServe staff members joined 35 volunteers from Shepherd of the Prairie to manage the recycling campaign at Lifest. 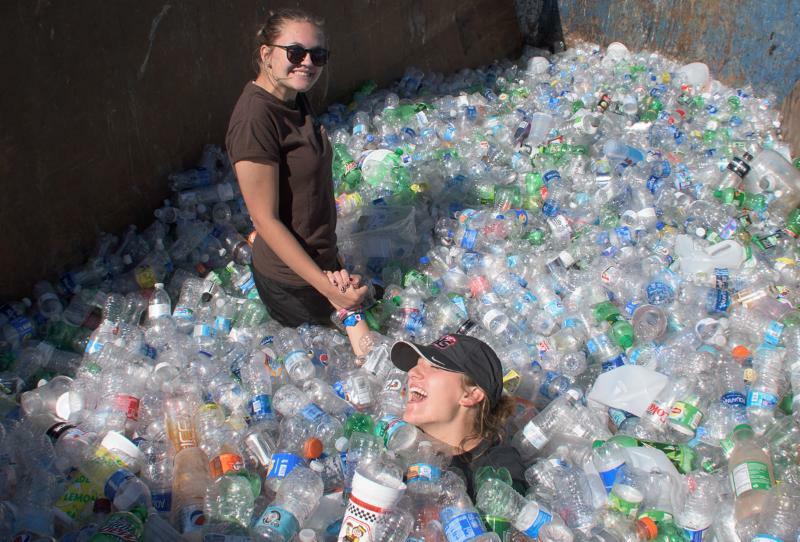 Over the 3-day event, they filled two 20-foot long dumpsters with plastic bottles and collected fifty pounds of aluminum. According to the local Solid Waste Department, the youth have collected 4.92 tons of recyclables over the last three summers. This is equal to saving 10,000 pounds of oil! A decade ago, Matthew and I never would have guessed that a prayer to help our community would turn into an opportunity to help recycle bottles and cans at events throughout the country. We are especially grateful for people like Andy who model how our faith is connected with everything we do–including the fate of a pop bottle! 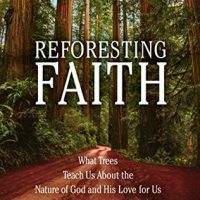 Recently, Faith Radio interviewed Matthew about caring for God’s creation. You can listen to the entire interview at myfaithradio.com. 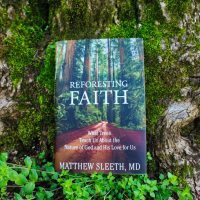 Dr. Matthew Sleeth provides biblical examples and helpful insight from his book Serving God, Saving the Planet. God’s initial call for humans to care for His creation can be found in the book of Genesis. Scripture tells us very clearly what not to do while stewarding God’s resources, but it’s up to us to honor His instruction. Dr. Sleeth provides a few examples from Leviticus 23:22 and Deuteronomy 24:20. Dr. Sleeth encourages us all to plant a tree with a young child and help them care for it. Similar to the growth of a tree from childhood, we learn about the importance of spiritual growth throughout our lives. 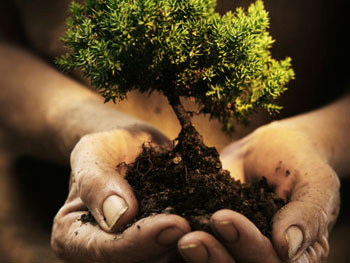 Caring for the planet and for our soul is our responsibility as Christians. It will help us grow closer to God’s heart and gives us a glimpse into His eternal plans. “Thank you!” I said. “That was my husband!” I could not have been more proud. 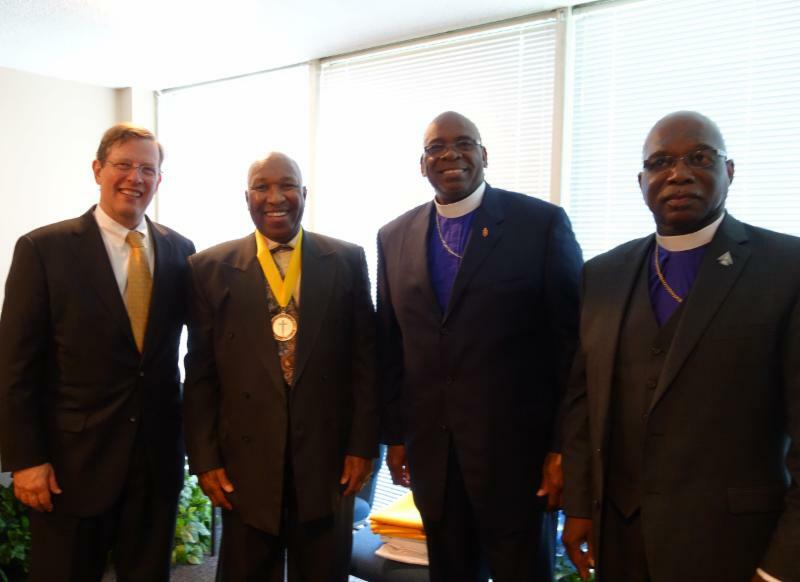 Matthew had just given the commencement address at Hood Seminary, an African Methodist Episcopal Zion school based in Salisbury, North Carolina. During Hood’s graduation ceremonies, Matthew was also honored with a doctorate degree. 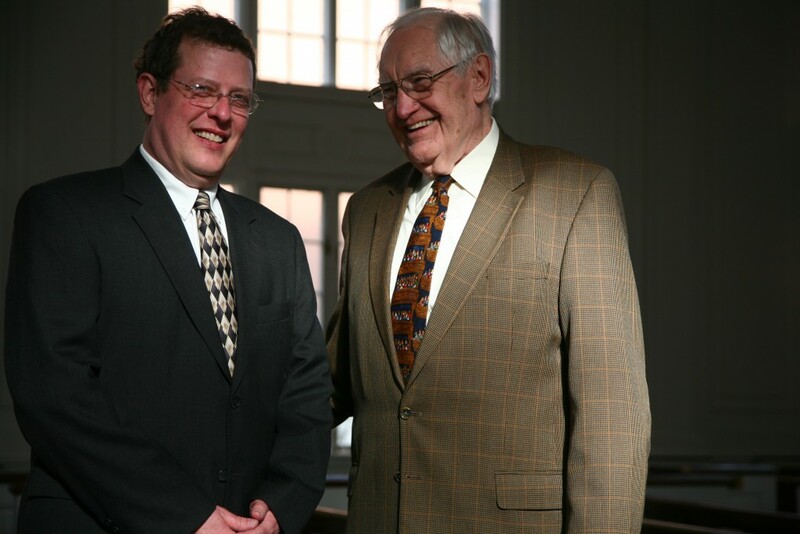 We first met the president of Hood Seminary several years ago through Blessed Earth’s Seminary Stewardship Alliance(SSA), a network of seminaries committed to teaching, preaching, and model biblical stewardship of God’s creation. Since its launch at the Washington National Cathedral four years ago, the SSA has grown to nearly 50 partner schools. Last year, the SSA spun off from Blessed Earth as an independent 501c3. When you’re having a tough week, think of Jesus in the exam room before beginning his ministry: he really was tested by the devil. And the the reaction to his first week of ministry? They took him to the cliff and tried to throw him off! Beginnings and transition are almost always difficult, but Christ helps us persevere. God loves a cheerful giver. Buy the pizza, leave change in the soda machine, maybe even send a gift to the alma mater (“other mother”) that helped raise you. Friends are like trees: the best time to plant is fifty years ago; the next best time to plant one is today. 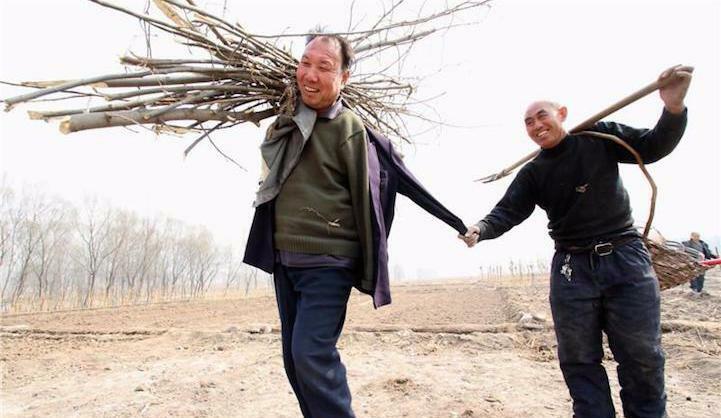 In an increasingly “connected” world, true friendship is becoming rarer and rarer. #4 Let the Bible teach you. So many of us want to instruct God instead of letting Him teach us. God left us a book to believe in: believe in it! Keep a gratitude journal and list all the things that make your day better: dental floss, hugs, shoes, literacy, sunshine. These seem like little things, but writing them down helps us appreciate bigger things, like God’s love for us, friendship, the Bible, and the forgiveness of sins. Sabbath-keeping is not a condition of getting into heaven; it just happens to be the condition of heaven when you get in. Taking our hands off the steering wheel one day a week reminds us that God is ultimately in control. When we work, we work; when we pray, God works. Pray unceasingly for Thy will to be done, on earth as it is in heaven. I love Maine. We raised our children there. I practiced medicine there. I found Jesus there. I’d love to go back and live there, but not in the winter. During the long shifts in the ER when the snow drifted and the sun set before four, I’d console myself by looking at a picture on the office wall of Hawaii. I dreamed of one day going to those tropical islands. But Hawaii is a long way from Maine. The trip wasn’t practical with young kids. When we entered ministry, a trip to Hawaii was out of our economic reach. But as a new Christian, I noticed a pattern. People often ended up serving in the one place they prayed not to go. It’s biblical. Jonah wanted to go to Joppa, but God and the whale sent him to Nineveh. When a pastor friend of mine entered ministry, he prayed for God to send him anywhere other than a Spanish-speaking community; he’s now the head of a seminary in Venezuela and he’s fluent in Spanish. Another friend began his career telling God that he wanted to serve anywhere but Africa. He told me this at the end of thirty years in Nigeria. So, I prayed (tongue-in-cheek): Lord, send me anywhere but Hawaii. Guess what? The pattern actually holds! I just got back from Oahu and preaching at the Hawaiian Island Ministries (HIM) conference. Don’t feel sorry for me. It wasn’t all work. Before the conference started, Nancy and I took several days to celebrate our 35th wedding anniversary on the less populated northern end of the island. We took some great hikes, including a little-used trail to a stunning lookout over Sunset Beach. But it wasn’t until we returned to Honolulu and were in the presence a few thousand brothers and sisters in Christ that we truly experienced paradise. The hospitality at the HIM conference was extraordinary: People we had never met asked us out to breakfast, lunch, and dinner. A girl gave me a drawing inspired by one of my talks. And everywhere there was a palpable, deep hunger to hear God’s Word. Have you asked someone new home to dinner in the last month? Have you given a Bible away yet this year? Are you praying regularly for someone at your workplace? Have you used what you gave up this Lent as an opportunity to witness about what Jesus sacrificed for our salvation? It’s nice to go places and meet new brothers and sisters, but God is everywhere. Jesus told us to go out in the world and spread the Gospel. Wherever you are, you’re out in the world. Spread the Good News! I’ll be praying for you. “Mahalo!” to our new friends in the Pacific Ocean. 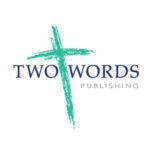 As many of you know, Matthew is writing a book that shares the Gospel by following the trail of trees through the Bible. 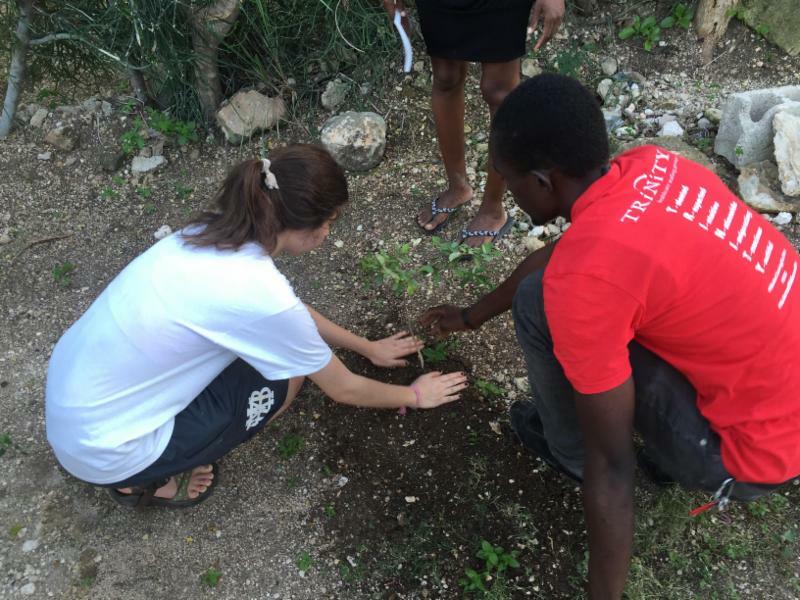 So when Ryan Bennett, our Blessed Earth Tennessee director, took a group to Haiti in December, we were thrilled to learn that they would be planting trees. Ryan took a team of eleven to Gressier, Haiti, about 20 miles west of Port au Prince. In the 2010 earthquake, ninety percent of structures in Gressier were leveled and most trees were either uprooted or snapped off. The team focused on three primary jobs. In the mornings, they worked on constructing a kitchen, guesthouse, and maintenance building on the church grounds. In the afternoons, they spent time with the school children, playing games and sharing gifts while explaining the gift of hope we have in Jesus. Evenings were reserved for tree planting. At dusk, the team visited neighborhoods surrounding the church, bringing Bibles and fruit trees: mango, breadfruit, citrus, cherry, and apricot. 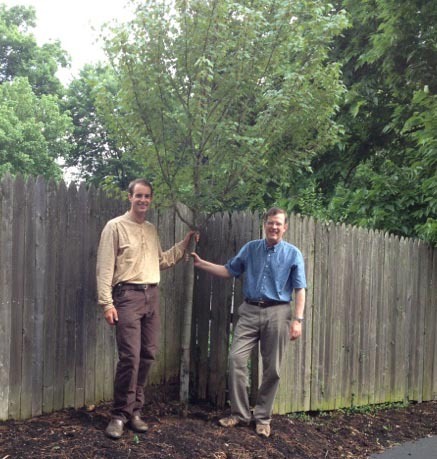 They knocked on doors and asked if they could plant a tree in the homeowner’s yard. If the villager said yes, they discussed the importance of finding a place where the soil was rich, where sunlight hit it, and where it could receive water. These conditions would help the tree grow big and strong and produce fruit. While preparing the site, Ryan explained how our lives are like trees. If we want to produce fruit, we need to make sure our soil is fertile, we have good exposure to the sun/Son, and that we are nourished with living water. The team offered the homeowners a Bible, since the Word is to our souls what water is to the trees. Many times, Ryan was asked into the house to pray with the family and share the gospel. Development experts believe that the cycle of poverty in Haiti–the poorest country in the western hemisphere–will not be broken until the land is reforested. Without trees, topsoil erodes, crops fail, and children die from hunger and disease. Trees, literally, give life. Similarly, the cycle of impoverished spirits–in Haiti and our own neighborhoods–will not be broken until our hearts are watered with the living Word of God. It is no accident that the Bible begins with the Tree of Life in Eden and ends with the Tree of Life in heaven, which bears fruit in every season and has leaves that heal the nations. At the center of our faith is Jesus, the new Adam, who died on a tree to give us life. Ryan’s team planted about 100 fruit trees in Haiti–and many more seeds of faith. This spring, we hope you will join us in planting trees of hope (physical as well as spiritual), wherever God has placed you! 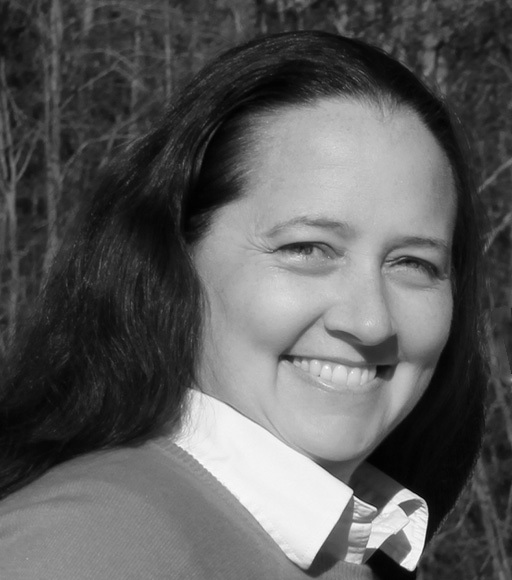 Since becoming Blessed Earth’s Northwest Director of Operations in the summer of 2015, Dr. A.J. 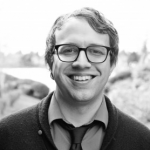 Swoboda has been meeting with Christian colleges and seminaries throughout the northwest region. In the last few months, ten schools have joined or are in the process of joining the Seminary Stewardship Alliance (SSA), a consortium of schools committed to reconnecting Christians with the biblical call to care for God’s creation. Four years ago, George Fox Evangelical Seminary became the first Northwest school to make this public, institutional commitment. In the last four months, every school that Dr. Swoboda visited has responded positively to joining the SSA. The ground has proven fertile as Christians across denominations work alongside one another for a common goal, namely, the care of creation. This movement amongst Christian educational institutions is also opening doors to non-religious neighbors all across the Northwest. 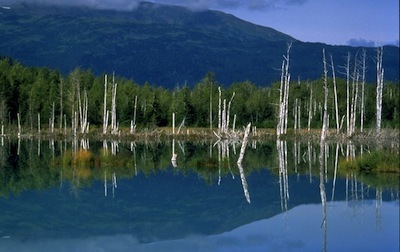 Environmental stewardship is part of faithful witness in the twenty-first century. 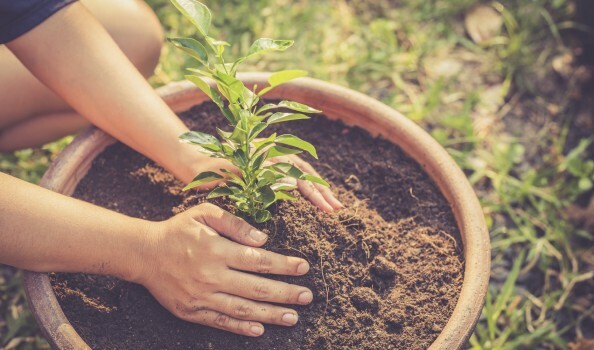 As environmental stewardship becomes a central tenet at the institutional level, it becomes more than an area of study, but an integral part of Christian life and witness. Students are being filled with the desire, and equipped with the ability, to nurture the earth. In turn, doors are opened to witness to people in our communities who already care about creation, but who do not yet know the God who created it all. An encouraging outcome can be seen at the most recent school to join, New Hope Christian College in Eugene, Oregon. New Hope has started a campus garden where students can grow food and learn to care for the land together. The SSA was started as a project of Blessed Earth, with a signing ceremony of twelve flagship schools at the Washington National Cathedral in April 2012. 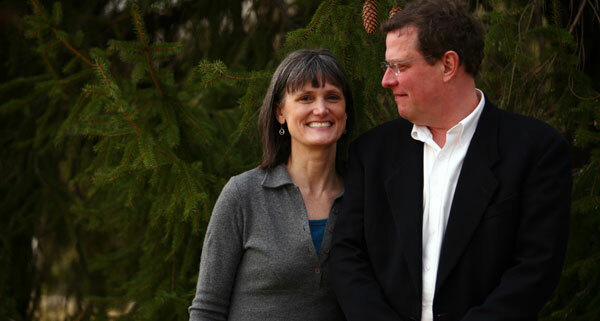 In 2015, the SSA spun off as an independent nonprofit, where Matthew and Nancy Sleeth continue to provide leadership as members of the SSA board. The SSA now has grown to nearly fifty schools. For more information, visit seminaryalliance.org. My son-in-law, Zach, gave me my Father’s Day present a little early this year. Before we moved into our townhouse, a large tree had died along the fence line dividing us from the neighboring apartment building. We got permission from our homeowner’s association to replant a tree. There was only one problem: a humongous stump–about three feet in diameter–was in the way. That’s when it comes in handy to have a son-in-law. Zach went to a tree farm and picked out a beautiful sugar maple. Before heading out of town on a work trip, I suggested that Zach plant the maple beside the old stump, even though it was a less desirable position. But Zach wanted to do it right. He dug and dug and dug. Several neighbors came by to watch and encourage. It took all morning and half the afternoon to fully remove the remains of the old tree. When planting time finally arrived, Zach backed up the pickup truck as close to the hole as possible. The root ball must have weighed a couple hundred pounds. Zach recruited Nancy to position the trunk while he backfilled. One of our neighbors gave us a water gaiter so we could keep the roots moist throughout summer. Zach returned later with a load of mulch to reduce evaporation and competition from weeds. Every time I walk by that tree, I marvel. And every evening when I admire the tree from our bedroom window, I thank God for sharing His love of trees with me (and giving me a son-in-law with a strong back). Last year, I read through the Bible underlining everything that scripture says about trees. From the Tree of Life in Genesis to the Tree of Life in Revelation, I discovered a forest with deep roots in faith. The first psalm says that a righteous person is like a tree. Abraham welcomes the angels under the oaks of Mamre; Deborah holds court under the palms; Zacchaeus shinnies up a sycamore-fig to see the Savior. Most importantly, Jesus, the new Adam, plants a tree–the cross–on Calvary and waters it with his blood, sweat, and tears. The Apostle Paul tells us that in heaven the leaves of the Tree of Life will heal the nations and bear fruit in every season. 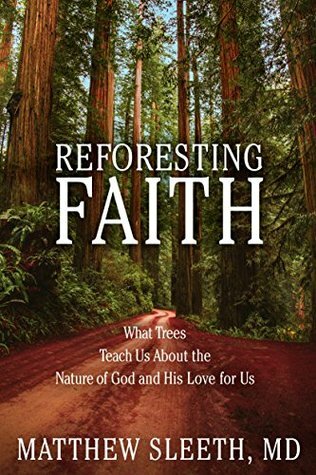 This summer, I have begun writing a book about trees and faith. Writing does not come easily for me. I rely on the Holy Spirit and the prayers of friends like you to help me. It’s been a wet summer so far, and Zach’s tree is flourishing. I hope that in days to come, my writing will help the faith of others flourish as well. Today we hear so much in the news about what’s wrong with today’s young people: they’re selfish, apathetic, and easily distracted. They spend all their time on their phones, and little of it in nature. 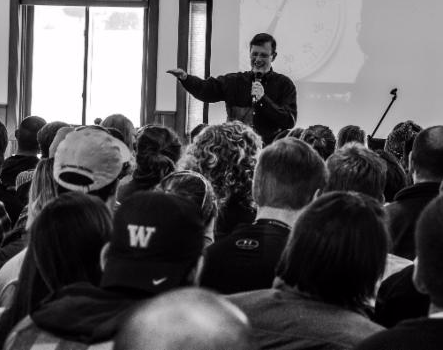 Recently, Matthew and I had the privilege of spending a few days in Colorado with several hundred college and seminary students who give the coming generation a good name. These students are part of A Christian Ministry in the National Parks (ACMNP). This summer, they will be leading worship services on Sundays in national parks, serving as chaplains to visitors and staff while also working for the park concessioners. Blessed Earth’s partnership with ACMNP began seven years ago when our friend, Spencer Lundgaard, became their executive director. A Christian Ministry in the National Parks is a grassroots, student-led ministry that started in Yellowstone National Park in 1951 with the dream of providing Christian community for the people working in, living in, and visiting the first national park in the world. Today, ACMNP lives its mission by sending 200 ministry team members into 75 locations in 25 national parks from Alaska to the Virgin Islands. Over 30,000 people worship together in ACMNP services every year, experiencing the glory of God by seeing it firsthand. 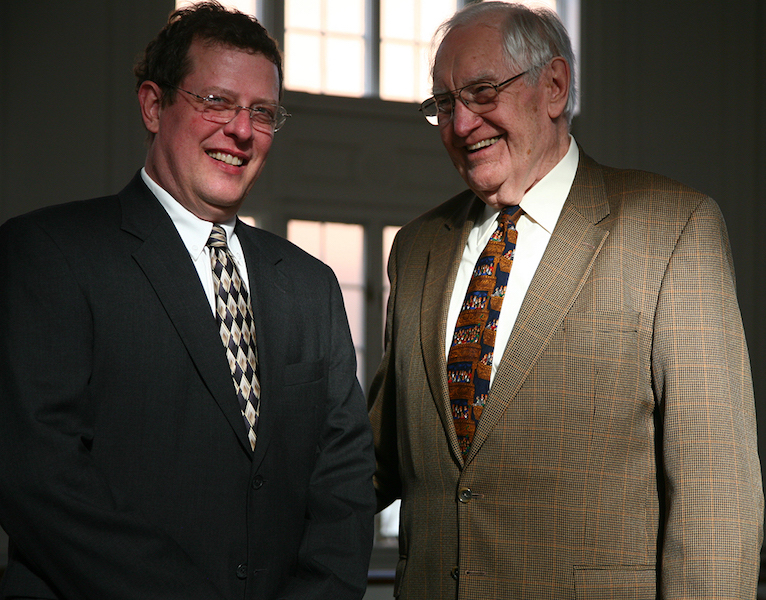 Several years ago, Spencer invited us to meet with his trustees and advisors. Specifically, Spencer wanted us to help cast a vision for intentionally integrating creation care with their ministry. Our hope was to help ACMNP share a Christian interpretation of the awe and grandeur of God’s creation. In April, Matthew and I had the honor of formally commissioning nearly 100 first-ever stewardship advocates. These young people are tasked with connecting the Creator with his creation as a foundation of all they do. It was a moving ceremony, full of the Holy Spirit’s presence, as well as a clear affirmation of Blessed Earth’s capacity to multiply through synergistic partnerships. If you visit a National Park this summer, I hope you will make it a point to attend the Sunday worship service and encourage these young ACMNP volunteers. They are the future of our church. And from everything we experienced in Colorado, that future looks bright!